Rising PSA after Prostate Cancer Surgery or Radiation: Can Nitroglycerin Help? Prostate cancer, for men with a rising PSA after surgery or radiation, has been treated in various ways. Among the newest potential treatments is one that comes from an explosive item which has been modified to heal rather than destroy. Prostate cancer surgery (a prostatectomy) can be quite intimidating. But as readers of my book and this companion blog know, I had a relatively successful prostate cancer surgery. Prostate Cancer Treatment: Watchful Waiting is Not a "Shoe-In"
The prostate cancer treatment debate about the value of watchful waiting after a diagnosis of prostate cancer keeps going around and around. For instance a couple of days ago I came across an article in the online Toronto News at a Glance. It boldly proclaims that according to a new study, watchful waiting for a man diagnosed with early-stage prostate cancer is quite safe. 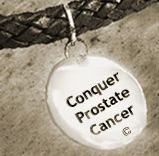 (See http://tnews.ca/watchful-waiting-for-prostate-cancer-is-safe-study/). This deserves further scrutiny and has prompted me to write the following comment in the form of a letter-to-the editor. No prostate cancer treatment is foolproof. Errors can occur, at least some of the time. This was reflected in a recent edition of the Journal of the American Medical Association (October 16, 2009). When comparing prostate cancer treatments a national study concluded that robotic surgery can result in more complications than standard prostate cancer surgery. That's not a new conclusion, but I'd like to respond to these findings anyhow. Prostate Cancer Treatment: Will a New Scientific Finding Make "Watchful Waiting" (aka, "Active Surveilance") More Viable? Prostate Cancer treatment, following an early stage diagnosis, tends to be aggressive in American medical circles. After consulting with their doctors, half of nearly 200,000 patients each year opt for surgery (primarily robotics), and the remainder generally choose some form of radiotherapy. Relatively few select High Intensity Frequency Ultrasound (HIFU) or cryotherapy, which respectively use hot or freezing temperatures to eradicate a man’s tumor. Q: My biopsy Gleason score recently jumped to a 9 (out of 10), so there's no question my prostate cancer is more aggressive than I thought it was. I've decided to have robotic surgery. How likely is it that I'll have a prostate cancer recurrence some time after my cancerous prostate is removed? This week a London Mail Online interviewer spoke with three of Britain's leading urologists, who did a masterful job of listing the "pros" and "cons" of each prostate cancer treatment option. After the review the reporter indicated that a Gleason score of 1-6 is least aggressive (mild), 7 is intermediate, and 8-10 is most aggressive. In point of fact, other doctors divide these categories into 1-4, 5-7, and 8-10. Furthermore, it should be underscored that all three categories refer to cancers localized within the prostate. These prostate cancers have not metastasized to other parts of the body such as a man's bones or upper extremities. Christmas Day, with its multi-colored trees and pageantry, enjoyed by Christians and non-Christians alike, is coming to an end as I write these lines at 11:45 pm on December 25, 2008. Whether you observe Christmas or Hanukah or Kwanzaa, this is a time to focus on light and hope in the face of darkness and despair, both past and present. It's with this in mind that I wrote a letter-to-the-editor of the New York Times after reading an extensive description of prostate cancer treatment in this morning's special news edition. For your interest I've reproduced my thoughts below, penned just an hour ago. I hope these words will serve as a reminder that whatever treatment option you or those you love end up choosing to treat prostate cancer, there's always room for hope. Prostate Cancer Treatment - Cut or Wait? Question: Why do you advocate robotic surgery when a patient and doctor feel that's the best way to go after a low-grade prostate cancer is first diagnosed? What's wrong with waiting until you see if things might get worse, before you choose surgery? - Martin G.
I'm an advocate of robotic surgery when appropriate, but would not dismiss active surveillance, as it is now called, when indicated. My only question after a low-grade prostate cancer is diagnosed is whether an annual biopsy will actually detect if a man's tumor has advanced. As far as I know, biopsies are done randomly (that is, the needle probe tests random prostate locations for cancer). In my own case, a previous biopsy missed prostate cancer two years before a followup biopsy, in spite of an elevated PSA score. That first one was a "miss," but my biopsy two years later was unfortunately a "hit". It is possible that a second biopsy might not catch the spread of a cancerous tumor, even if the original biopsy discovered it at another location an earlier stage. For that reason surgery (of the robotic sort, to make for a more pain-free recovery) was the route I took. I invite the comments of doctors or fellow survivors. Do you agree or not, and please tell us why? New York Times editor, Dana Jennings, has written an ongoing series of insightful articles on experiencing prostate cancer and its side effects. His most recent column is “Real Men Get Prostate Cancer”, and it’s worth reading. (See http://well.blogs.nytimes.com/2008/11/18/real-men-get-prostate-cancer/#comment-112157.) My response to his thoughts follows. -Rabbi Ed Weinsberg, Moderator, www.ConquerProstateCancer. Your openness is both astonishing and reassuring for prostate cancer patients and survivors like myself.